From pomp to punk, the UK has always steered away from black and white perspectives. 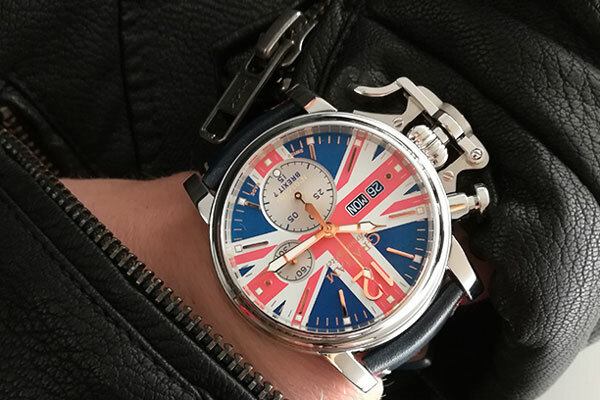 The Graham Chronofighter Vintage UK shows this spirit in its true colours, in this case those of the union jack flag. The timely Swiss watch with a British heritage addresses Brexit with heart-felt honesty – by adding a question mark. As in any love affair, this tiny piece of punctuation speaks volumes. Should I go or should I stay? Can we still be friends? Will we ever get back together again? It sets the tone for a timepiece with stunning looks, a love of tradition and the courage to look to the future. A red, white and blue painted dial flags up a mood of familiarity with a twist on this automatic chronograph with a day-date display. At first sight, the red and white stripes are boldly patriotic, yet a concertina effect lets through more blue than usual. Modernist design language or a subtle hint that a variation on European blue is still welcome? The iconic Graham Chronofighter trigger mechanism on the left-hand side enables a fast-action start/stop – a Brexit negotiator’s dream. The eye-catching timepiece comes with a blue calf leather strap with red and white stitching. A brown alternative is available for a stronger nostalgic statement.